Yeah, you read that right, nerds: The next starship Enterprise (registry code NCC-1701-F). 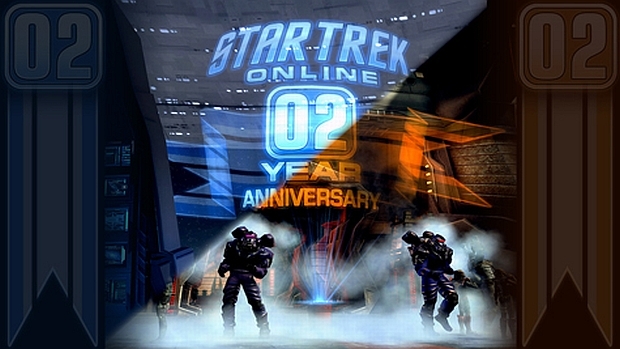 Well, not the Enterprise itself, but an Odyssey-class Federation cruiser, the same model as the Enterprise-F. Players who show up at Star Trek Online's 2nd Anniversary celebration, an event running from today through February 6th, can undertake a special mission that will reward them with the ship. Klingon faction players can do a similar mission to score a Bortas-class battlecruiser, a ship that, from the screenshot below, looks a heck of a lot like the Terran battlecruiser of Starcraft. Veteran players need not worry about seeing newbs running around in super-starships, though, as the virtual gift boxes that contain the ships cannot be opened until the character that received them reaches Vice Admiral rank (level 50). There you go, new players. It's a goal for you to phaser your way towards! Fun fact: Data commands the U.S.S. Enterprise-F in Star Trek Online's alternate future timeline!